In 2004, Randall County, Texas faced a problem. The aging courthouse was cramped, unsecured and difficult to work in and the county couldn't afford to renovate the historical structure. That’s when County Judge Ernie Houdashell had an idea and turned to Wal-Mart for help. The result has everyone smiling three years later. Randall County’s new Judicial Center provides state-of-the-art security, abundant space and more parking than this Texas Panhandle county is likely to need well into the next century. The County’s solution also helped Wal-Mart out of a jam; a huge empty building that no longer served its original purpose. Wal-Mart Stores and Sam's Clubs are often so successful that they outgrow their buildings and have to relocate to better serve their customers. Canyon Texas had been no exception. When the retailing giant replaced their existing Canyon store with a new super center it left the original store unoccupied. Judge Houdashell’s creative idea was to build a new courthouse inside the all but abandoned former Wal-Mart store. Not far from where Charles Goodnight drove 1,600 cattle into Palo Duro Canyon in 1876, Houdashell and Wal-Mart have created a courthouse annex that rivals any in the country. You enter the Judicial Center through a security checkpoint - manned by a sheriff's deputy armed with a large pistol where once you would have been greeted by a Wal-Mart greeter. The friendly deputy instructs you to walk through a metal detector similar to the devices used at airports and takes your driver’s license. Another deputy in a nearby booth carefully monitors dozens of security cameras located inside and outside the building. Your license is scanned and returned and the deputy gives you a sticky label with your picture and name to be worn while you are inside the facility. There's also a hardened shell where many of the county records dating back to 1880 are stored. The shell, comprising concrete and steel-reinforced walls, is built to withstand an F-3 tornado, Houdashell said. The jail's holding facility, which has been certified by the State Commission on Jail Standards is out of public view. 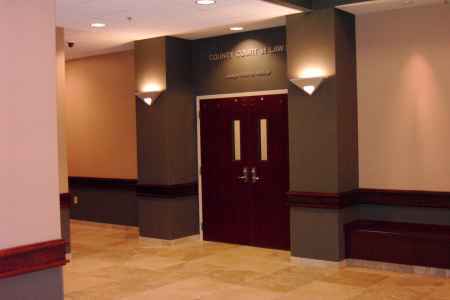 The holding center is intended to provide a secure place for criminal suspects to await arraignment in one of the five state-of-the-art courtrooms. What is visible are several female jail trustees armed with glass cleaner, towels and furniture polish to keep the judicial center gleaming. District Attorney James Farren cannot get over the space in which he and his staff get to work these days. “The old DA's office, just off the Courthouse Square, was - shall we say - a bit snug”, Farren told reporters during the official ribbon cutting last January. “The old building was so cramped that police officers had to be careful to maneuver themselves in such a manner to keep their weapons away from criminal defendants if they happened to pass each other in the hall”, Farren explained. In the new justice center, everyone has plenty of room. As a surprise bonus, the place is virtually soundproof. The new justice center sits about 60 yards south of a high-speed track with freight trains roaring by at 60 to 70 mph. But you don't hear the trains as they rumble past the building. "You have to look up to notice a train going by," Farren said. "And after awhile, you just kind of tune it all out." Where once the building was filled with shoppers and Wal-Mart employees, the district clerk, county clerk, DA, three district judges and two court at law judges call the new new Wal-Mart Courthouse "home" nowadays. Houdashell is mighty proud of the finished product that has emerged from months of negotiation with Wal-Mart and the subsequent construction effort. The county issued certificates of obligation totaling more than $8 million to revamp the place. 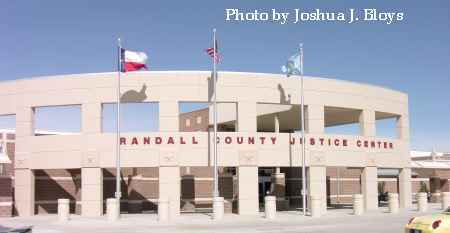 The new justice center marks the beginning of an era in Randall County. It's a gem that bears no resemblance to its former life as a retail outlet. It has produced smiles on the faces of those who work there - and likely will bring smiles to many who do business there. As for the old courthouse which was built in 1908, county officials were cautiously optimistic. Officials remain hopeful the state will deliver money to help pay for its renovation, after which the commissioners court will move into the historic building and raze the North Annex which was built in 1957. Author's Note: After I wrote about the Wal-Mart store that Randall County converted into a justice center, some of you asked about the former justice center that I call home. 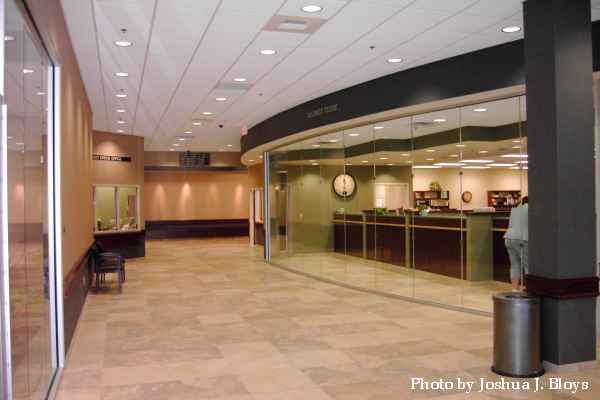 Since I've been here, part of my home has also served as a Justice of the Peace office and the city's police station. . . You can learn more about my own unusual conversion here.